This 40-year-old Crescent Beach home, formerly a summer home, received a complete, award winning makeover and restoration. A grand addition was added to enhance its distinctive West Coast architectural style. A Lindal western red cedar window wall on the front and the back of the house adds to the unique West Coast character. The biggest change to the home’s formerly cramped interior was the relocation of the staircase. This change allowed for the creation of a spacious new open concept kitchen, dining and living space. The staircase was moved to make the home a more functional space providing a natural flow and access to the kitchen, dining area, living room and outdoor space. 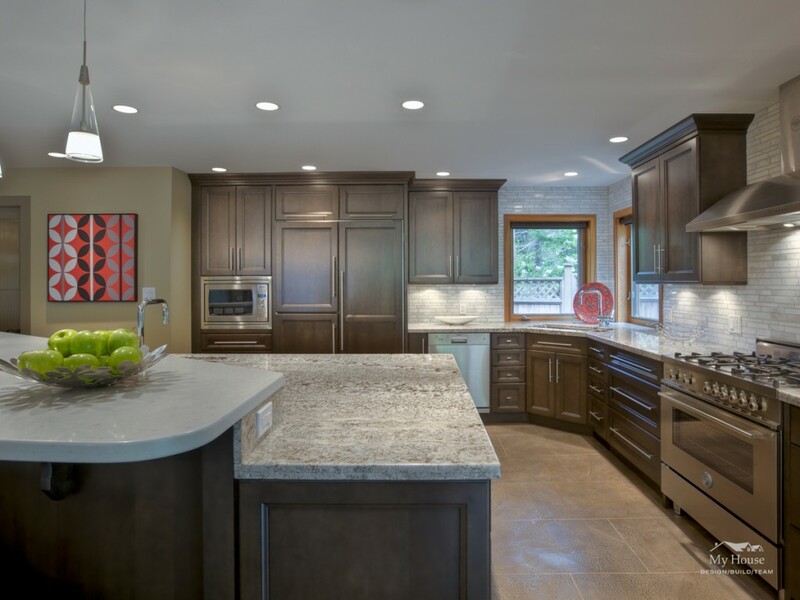 The large, open kitchen is perfect for entertaining the client’s large and small gatherings. The kitchen Island, a functional showpiece, provides seating and storage and a sink for easy food and drink preparation. Abundant dark wood cabinets and drawers compliment the light, tiled backsplash and stainless-steel hood vent. A cozy eating space extends off the kitchen providing a beautiful view out over open green space and newly created outdoor living space. The living room was transformed from a cramped space into a beautiful, spacious haven the owners could spend time in and enjoy. The expansive windows afford a dramatic view of tall cedars giving the feeling of a sanctuary within the woods while drawing in the natural light and beauty of the outdoors. A new master suite includes a cozy nook overlooking the green space below. Adjoined by a luxurious bathroom with a walk-in, sit-down shower. A glulam beam and glass roof canopy extend from the south and west corners of the house, creating a beautiful covered outdoor living space. Heaters and a fireplace, including a pizza oven, provide a wonderful outdoor living area that can be used all year long. Extend your living space to the outdoors and create a place to cook, relax, and entertain. Call The My House Design Team to get started today. Or, see other Renovations in Vancouver and Lower Mainland by the My House Design Build team. See also our Outdoor Space Renovation gallery.